Hello fans! 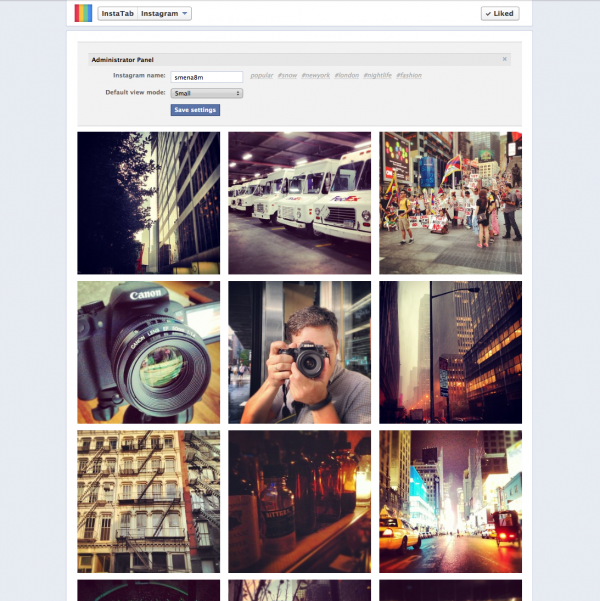 This is a home page of the Facebook application “Instatab“. 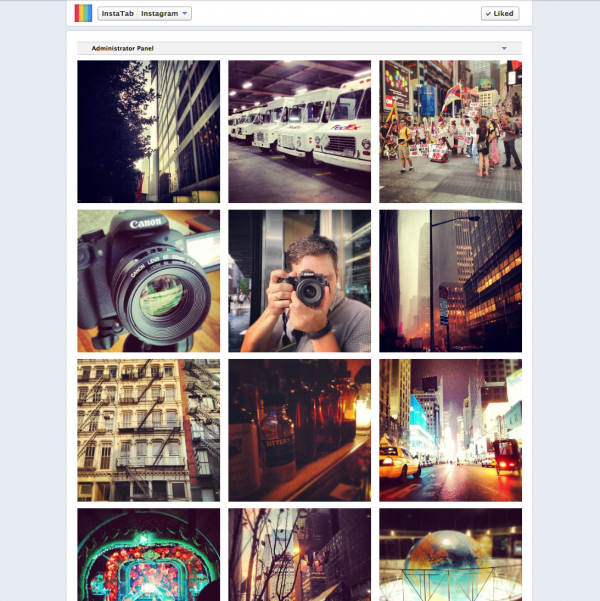 Publish your Instagram feed to your Facebook page. Search photos by Tag, comment, like and share! Visit this landing page to install app on your page or check some example pages. Hi There! I am wondering how to customize the tab on our facebook page. I have seen it on a couple FB pages but can’t figure out how to create one! Is there a website that has steps to follow? Hi, I’m missing a function, where I could share a photo from inside InstaTab to my page wall, as page admin. I can only share/post it to my personal profile with my personal account (ID). I would like to share a photo on my page wall as page admin (with page ID) – to remind people of this tab being there for them and there is no way to at least share a direct URL – one that would actually take people to this tab or an individual photo. Whatever link I copy/use, it just takes me to my page. Is there a way to add this option? And there’s one more thing. I don’t know if it’s just me or if it’s a bug, but when I switch to Use Facebook as ‘page’, the InstaTab doesn’t load .. it opens – goes to the app, but it does not load the images. I have this same problem… Did you figure out how to solve it? I have the problem right now. Is there a solution for it? I have same problem. Does it matter that I have username with underscores? Hi, if Photo Privacy is ON in my Instagram account. That’s mean I can see the #(hashtag) photos posted on InstaTab? You can see public photos only. That’s a really simple but great app! The feature I found missed if feeding pix made in certain location. 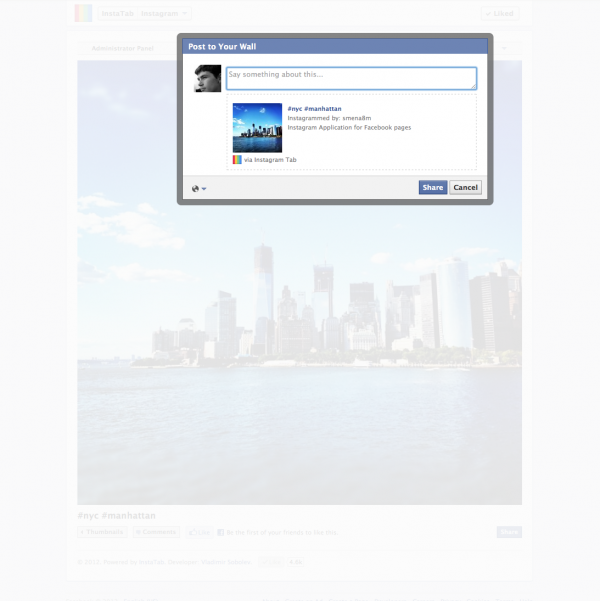 Similar what guys at http://worldc.am do but integrated to FB. Just started using instatab for my fan page and really liking it. I’m displaying all the photos based on a hashtag which works perfectly but is there a way to find out who actually took the instagram photo as I would like to ask their permission to publish it on our timeline? In next update these features will be available! How can I have access to the branding options? 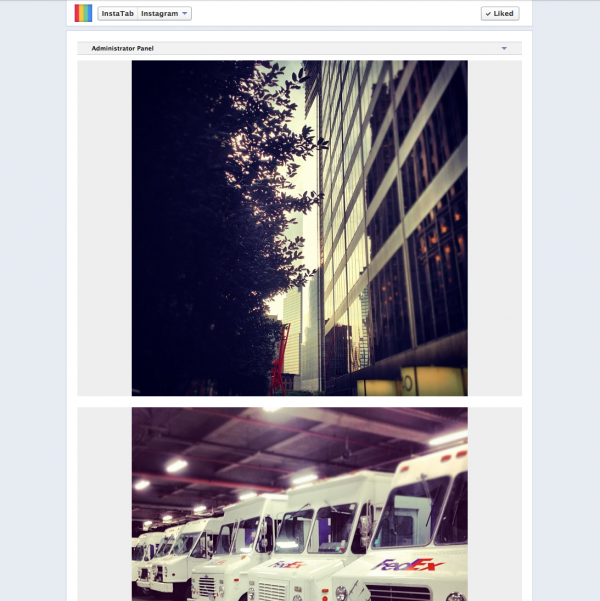 Somebody can explain me why I can’t show more than a row of pictures in my Instatab page on facebook? I have 6 pictures under my hashtag #photomeridian2013 but it only shows 3 in small size or 5 in thumbnail mode as you coul see at https://www.facebook.com/EdificioMeridian/app_168188869963563. Check your account privacy settings, looks like 3 more pictures are private. Just wondering how to get branding options and customize the tab on our facebook page? is it possible to show 2 different feeds in one instatab? we are a dj duo an i want to share our both feeds at the same tab. You both can use the same tag to tag photos and then setup app to show photos by that tag. Does it take a while to show hastag feeds? I have been waiting a couple of minutes and the page is busy, but nothing is loading. All search results caches for a short period of time. If you see infinite spinner – something is wrong or some updates is in progress or just a bug. Hey Vladimir, could please tell me how do i customize my Instatab’s tab on Facebook? I want to make a # search feed, but, i want to moderate the content…its possible? No options for that at this moment. I’m working on it. I see only a part of all photos with the hashtag #wrevents why?? How do you add a small description before the photos section? I want to do an introduction about the tab page. Hi Vladimir, im just wondering if you can add the “follow us on instagram” button 🙂 thanks! i install instatab in my facebook page but when i try to search for my instagram name i can’t find it .. and my instagram account is not private . can you help me in this problem ? Show me your page and your Instagram name please. I am having the same problem. I can install the app but no matter what I list, my business name or the # nothing loads. Ever. I have installed the app on another page I manage with no dramas. 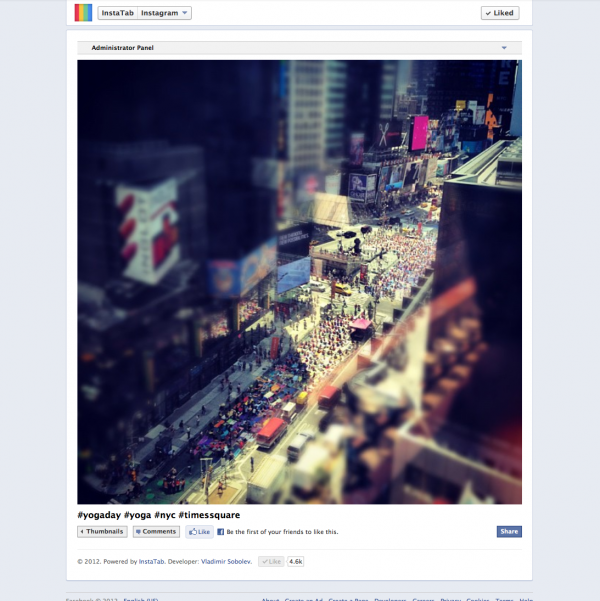 Can you show your Facebook page? I’m not able to use #hashtags at my instatab. What’s wrong ? The spinner are running, and nothing happens. If I use the Instagram name it’s OK- but I want all the # showed…. Only single hashtag search available in app. Show me you page and hash tag please. How do I get the branding options and how to I customize the tab. 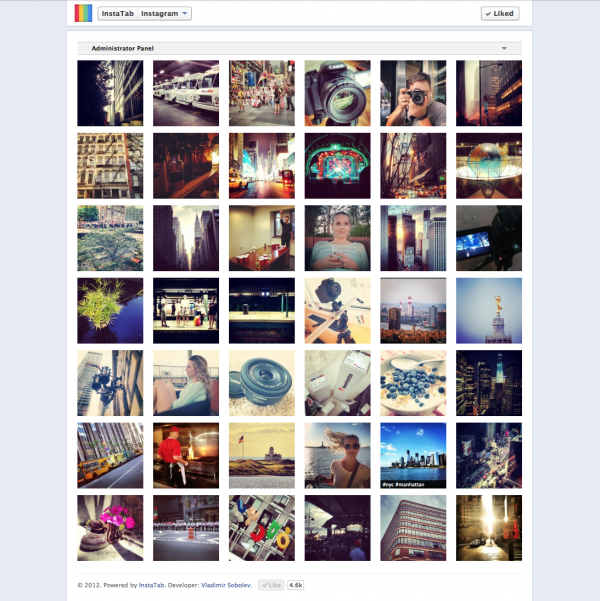 I see some instatab tabs with the rainbow colors, I only see the standard blue tab on my Facebook page. how do i personalise the instagram tab image to something in my own brand? I can offer a branding pack for you. Contact me via email. I’ve installed the tab on my FB page and added my Instagram username but no pictures are shown under the Administrator Panel bar, eventhough there are pictures on the Instagram profile. Why is this? Am I missing something really simple? Hi! I already have Instatab in the like page I’m managing. How can I add my the org’s IG account? So it will be visible in the Instatab in FB. Click on Administrator Panel and enter Instagram name there. Добрый день, у меня Instatab не отображает фото по названию аккаунта в Инстаграме (oldie.cars), а только по хэштегу, таким образом в ленту попадают чужие и нежелательные фото. Или мне нужно придумать уникальный хэштег? У вас всего 2 фотографии в акаунте – нужно поменять “Layout” Mode на “Normal” в настройках аппа. Hi, I am trying to add this app to the Caledon Farms FB page, but it’s not working properly. The app installed properly, but when I add my Instagram account name, no feed shows up. Can you help please. Thank you. If you have less than 6 photos on your account – change layout mode to quarter or so in settings. Trying to add to a work page I manage. Do I put my instagram name as #dikeoucollection or dikeoucollection? Can’t get either to load properly. Do I need to wait for images to populate? “dikeoucollection” for account name and “#dikeoucollection” for hash tag search. If you have less than 6 photos on your account — change view mode to normal or quarter. It keeps on saying “Empty Feed… Check your Instagram account privicy settings or add some photos.” but I actually have photos in it. we were already using Insta Tab on Facebook. Today we just changed the hashtag but it does not work, it does not show any pictures (when it is supposed to show at least 4 photos).